The confused party guests at first watch as the victim struggles on the ground before moving in to help him. Cell phone footage obtained by Spanish language station Americateve shows Yemil Arguelles get hit by a stray bullet at a Kendall party. 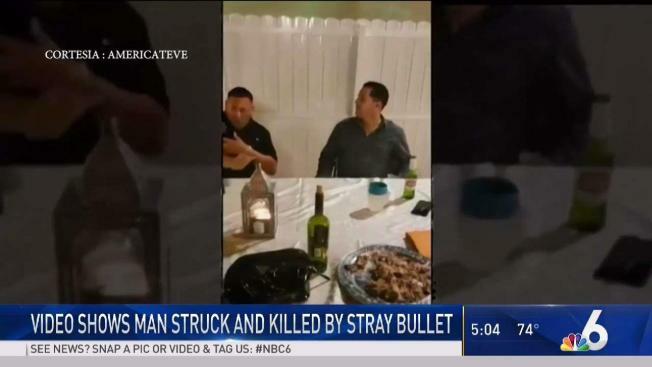 Disturbing footage shows the moment a Miami-Dade man was fatally struck in the chest by a stray bullet over the weekend while attending a house party. As the camera pans over, Arguelles is sitting with another man when a pop is heard and he suddenly grabs his chest before falling out of his chair. The confused party guests at first watch as Arguelles struggles on the ground before moving in to help him. Detectives determined the shot was not fired from the party location, and are asking anyone with information to call Miami-Dade Crime Stoppers. "He leaves behind young children, his wife and his family members and at the time of this holiday season they’re all really upset and they’re asking for the community’s help to solve this case," Det. Zubair Khan said.